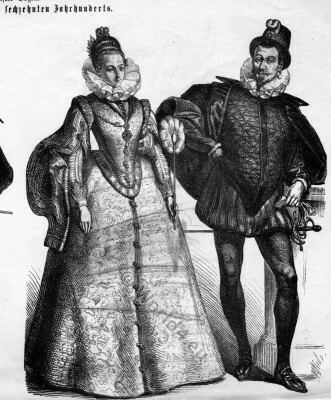 This entry was posted in 1545, 1546, 1547, 1550, 1558, 16th Century, Court dress, France, French fashion history, Hairstyle, Headdresses, Nobility, Renaissance and tagged Augustin Challamel, Houppelande, Renaissance fashion era on 6/25/14 by world4. 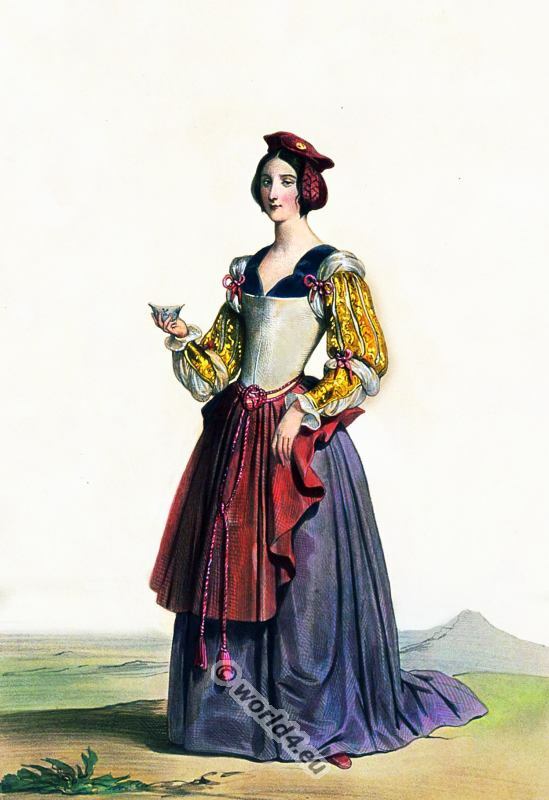 Lady from the time of Louis XI., 15th century clothing. Lady from the time of Louis XI (1423-1483), 15th century clothing. 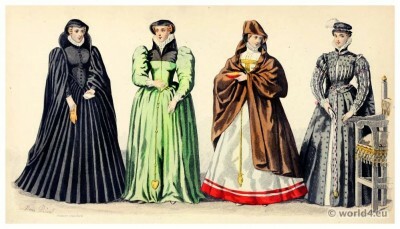 Late medieval Burgundian gothic period costume. Louis XI. – With a clear view of its political benefits, while often favored by fortune – was a forerunner of royal absolutism and centralism in France. This entry was posted in 15th Century, Burgundian dress, Court dress, Nobility and tagged Beret, Burgundian fashion period, Gothic costumes, Houppelande on 10/10/13 by world4. 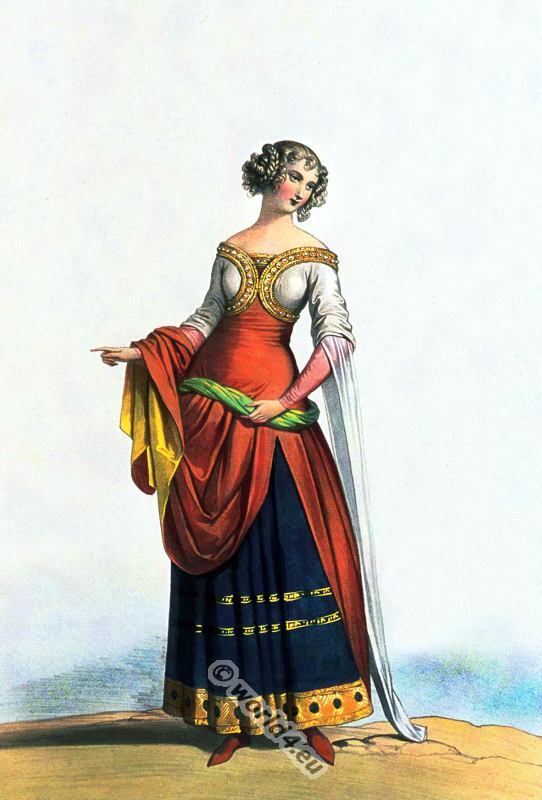 French noblewoman costume in 14th century. Court of the French King Jean II. (frz. Jean II. le Bon; 1319-1364). This entry was posted in 1350, 14th Century, Burgundian dress, France, Middle Ages and tagged Burgundian fashion period, Costumes historiques de ville ou de théatre, Gothic costumes, Houppelande, Medieval costume on 10/8/13 by world4. German Citizens in 1480. Gothic fashion period, 15th century. 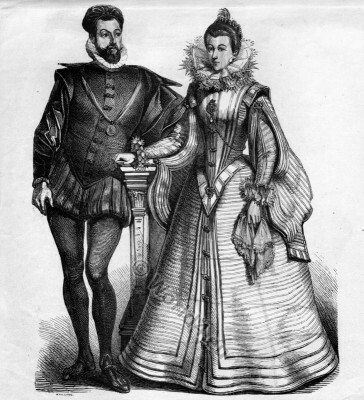 The man is dressed in the typical dandy fashion, late Gothic dress. He wears a beret with a large feather, a pleated shirt with sash provided, plus a close-fitting trousers (Miparti), belted at the waist. Toed shoes, Poulines, with a long narrow tip. Over his shoulder he wears a coat that is held together on the right shoulder. This entry was posted in 1480, 15th Century, Germany, Hat, Headdresses, Middle Ages, Renaissance and tagged Beret, Cotte, Gothic costumes, Hennin, Houppelande, Medieval costume, Miparti, Poulines, Schaube on 4/13/13 by world4. Renaissance Fashion. Women`s Costume of German Nobility, 1450, 15th Century. The left figure shows an unmarried woman, which is characterized by their uncovered hair. Her long hair is braided in some cases, combined with false hair pieces and decorated with a wreath of flowers. 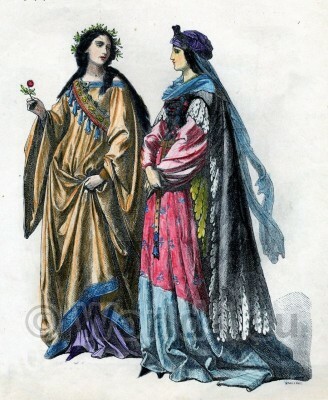 Both women are wearing the round-cut cotta, or Gamurra with long, lush ornamental sleeves. 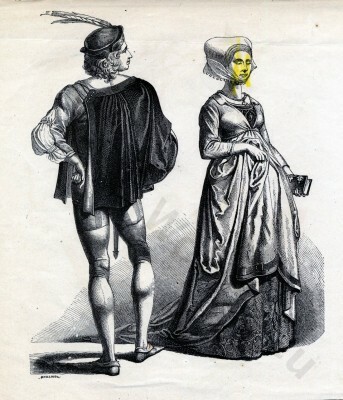 The Gamurra was closely fitted top and highlighted the figure of the woman. The section was mostly kept around. 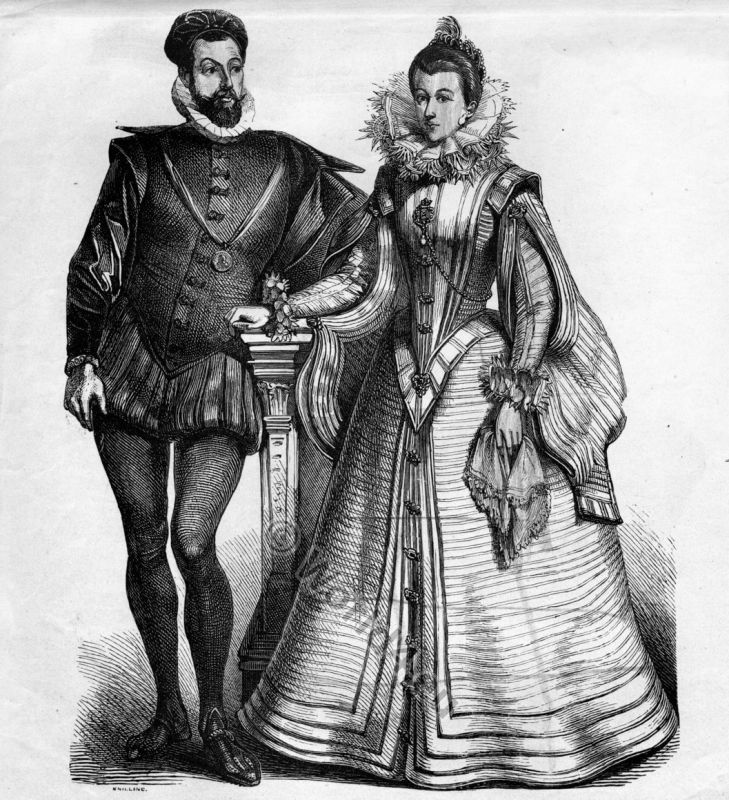 The sleeves were richly decorated and fanciful, usually sewn only slightly and could be replaced. As material precious materials were used. Furs from Russia could be introduced by the brisk trade, the Italian textile manufacturers, provided the highest quality fabrics such as satin, gold-embroidered brocade, bright silks and velvets, patterned as a novelty. The movement, in such clothes, was slow and stylized. The colors dominated greens, reds and yellows. 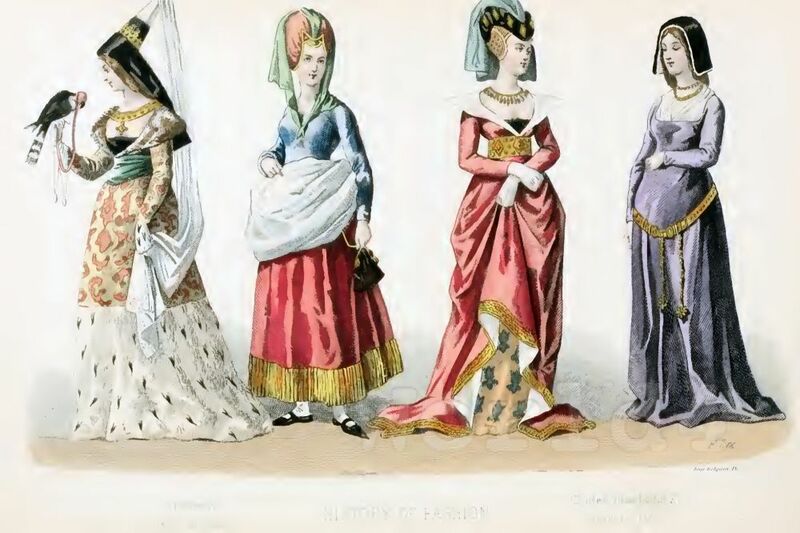 Strengthened by the bourgeoisie in the cities of the Middle Ages, with its guilds, a sophisticated tailors’ guild was formed, which dominated the fashion required for this narrow, body-hugging cut. Under the Gamurra dress the woman wore the loose-fitting Chemisse that set by the wide sleeves and round decorative cutouts, bright points and gave the richly decorated dress additional visual complexity. Popular were the embroidery of seams, especially at the neckline, different colors emerged. Over the Camurra they carry Cioppa, a robe with ornate hem in bright, clear colors. The Cioppa worn belted high, with long sleeves and trim is made of a train. It is on this figure, the clothes edge, occupied houppelande, a fashionable decoration of the Middle Ages. The right-married woman wears a head covering the sella, with a long veil. This entry was posted in 1450, 15th Century, Court dress, Germany, Hairstyle, Middle Ages, Nobility, Renaissance and tagged Cioppa, Cotta, Gamurra, Houppelande, Renaissance fashion era, Renaissance female clothing on 3/17/13 by world4.